-> derived products generated by AZTI. BALTIC daily (1km) dataset-oc-bal-chl-multi_cci-l3-chl_1km_daily-rep-v02 Baltic 1997-09-04 to 2016-12-31 BalAlg is an adaptation of the OC4v6 algorithm for the Baltic Sea (Pitarch et al., 2016). 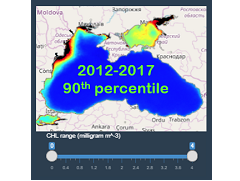 Moreover, AZTI has generated new products representing the 90th percentile of chlorophyll-a values between 2012 and 2017 (6 years) in several european marine regions. The Commission Decision (EU) 2018/229 of 12 February 2018, that summarizes the results of the 3rd phase of the WFD intercalibration exercise, include the 90th percentile of chlorophyll-a within a 6-years period as the indicator to assess the quality of some marine regions across de EU. How is the Copernicus Marine Service information integrated in CHLO4MSFD Service? 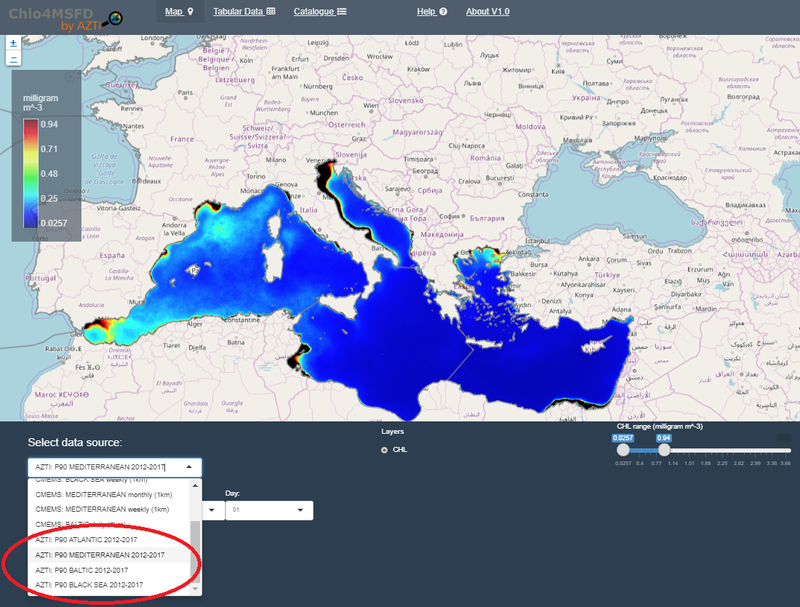 CHLO4MSFD harvests the above mentioned products from Copernicus Marine WMS (Web mapping Service) service, and through its interface controls, generates requests to view or extract data from those products. How is Copernicus Marine Service information be useful for this Service? The data delivered through the CHLO4MSFD portal is primarily based on products provided by Copernicus Marine Service (http://marine.copernicus.eu), and thus, this service reinforces the visibility of Copernicus Marine Service datasets to users contributing to the MSFD, and facilitate understanding of these data to promote their introduction in MSFD. Concerning the expected contribution to the MSFD, this service will try to stimulate actors responsible for the monitoring and assessment requirements under the MSFD to use data derived from other sources than those used traditionally, and implement appropriate methodologies to incorporate these into accurate and coherent assessment.